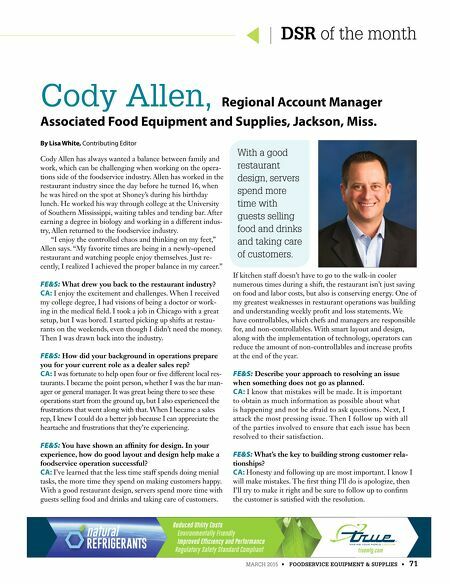 natural refrigerants Reduced Utility Costs Environmentally Friendly Improved Efficiency and Performance Regulatory Safety Standard Compliant truemfg.com MARCH 2015 • FOODSERVICE EQUIPMENT & SUPPLIES • 71 DSR of the month Cody Allen, Regional Account Manager Associated Food Equipment and Supplies, Jackson, Miss. By Lisa White, Contributing Editor Cody Allen has always wanted a balance between family and work, which can be challenging when working on the opera- tions side of the foodservice industry. Allen has worked in the restaurant industry since the day before he turned 16, when he was hired on the spot at Shoney's during his birthday lunch. He worked his way through college at the University of Southern Mississippi, waiting tables and tending bar. 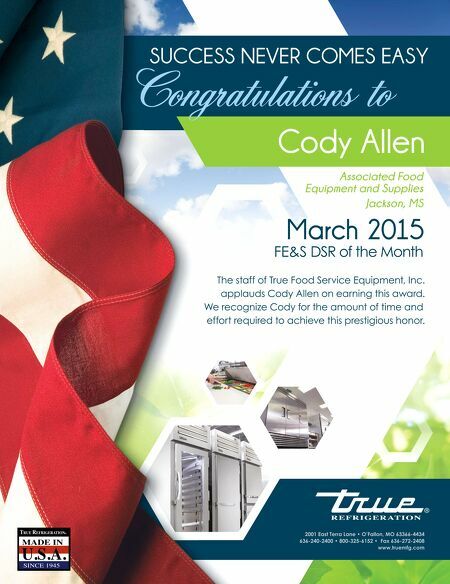 After earning a degree in biology and working in a different indus- try, Allen returned to the foodservice industry. "I enjoy the controlled chaos and thinking on my feet," Allen says. "My favorite times are being in a newly-opened restaurant and watching people enjoy themselves. Just re- cently, I realized I achieved the proper balance in my career." FE&S: What drew you back to the restaurant industry? CA: I enjoy the excitement and challenges. When I received my college degree, I had visions of being a doctor or work- ing in the medical feld. I took a job in Chicago with a great setup, but I was bored. I started picking up shifts at restau- rants on the weekends, even though I didn't need the money. Then I was drawn back into the industry. FE&S: How did your background in operations prepare you for your current role as a dealer sales rep? CA: I was fortunate to help open four or fve different local res- taurants. I became the point person, whether I was the bar man- ager or general manager. It was great being there to see these operations start from the ground up, but I also experienced the frustrations that went along with that. When I became a sales rep, I knew I could do a better job because I can appreciate the heartache and frustrations that they're experiencing. FE&S: You have shown an affnity for design. In your experience, how do good layout and design help make a foodservice operation successful? CA: I've learned that the less time staff spends doing menial tasks, the more time they spend on making customers happy. With a good restaurant design, servers spend more time with guests selling food and drinks and taking care of customers. If kitchen staff doesn't have to go to the walk-in cooler numerous times during a shift, the restaurant isn't just saving on food and labor costs, but also is conserving energy. One of my greatest weaknesses in restaurant operations was building and understanding weekly proft and loss statements. We have controllables, which chefs and managers are responsible for, and non-controllables. With smart layout and design, along with the implementation of technology, operators can reduce the amount of non-controllables and increase profts at the end of the year. FE&S: Describe your approach to resolving an issue when something does not go as planned. CA: I know that mistakes will be made. It is important to obtain as much information as possible about what is happening and not be afraid to ask questions. Next, I attack the most pressing issue. Then I follow up with all of the parties involved to ensure that each issue has been resolved to their satisfaction. FE&S: What's the key to building strong customer rela- tionships? CA: Honesty and following up are most important. I know I will make mistakes. The frst thing I'll do is apologize, then I'll try to make it right and be sure to follow up to confrm the customer is satisfed with the resolution. natural refrigerants Reduced Utility Costs Environmentally Friendly Improved Efficiency and Performance Regulatory Safety Standard Compliant truemfg.com With a good restaurant design, servers spend more time with guests selling food and drinks and taking care of customers.